The eleven European tourists exploring Antelope Canyon on a fine summer day in 1997 probably never considered drowning in a desert slot canyon to be a possibility. 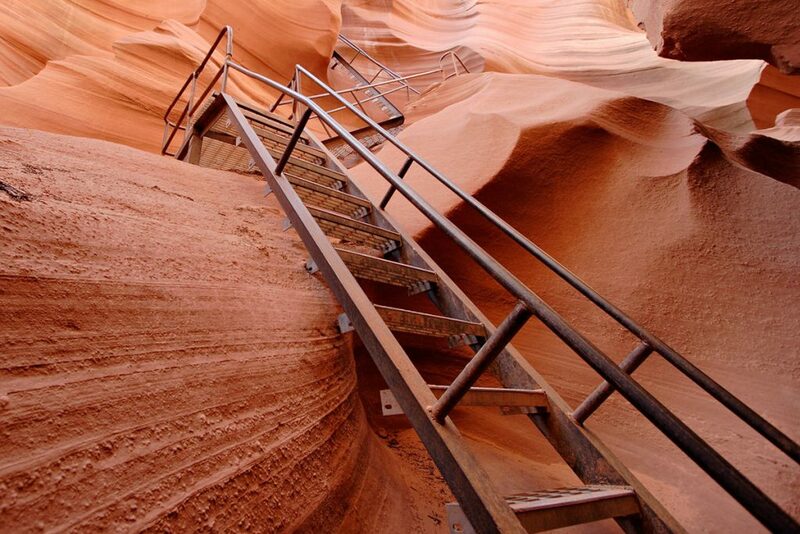 They may have known that water carved those sandstone walls into fantastical curves and angles. But it wouldn't have seemed like an ongoing process. Why would anyone be thinking of water, standing on dry sand, with shafts of sunlight spearing through from the narrow opening above? Despite it being the height of the Arizona monsoon season, it wasn't raining. 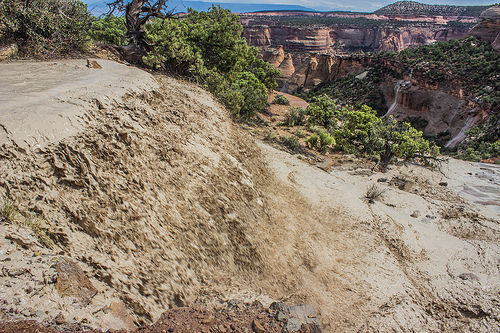 It started with the sandy silt on the canyon floor leaping six inches into the air. Tour guide Pancho Quintana and his group heard a roar so loud it drowned out screams. The solid rock walls shook. They began running, trying to find a place to climb out. And then they were hit by a wall of water that filled the canyon to a depth of eleven feet. Bodies were thrown into the walls. People might find a grip for a few seconds before debris or other bodies hit them and tore them away, tumbling them down the canyon. Pancho was the lucky one: despite the water and rock tearing off his clothes and skin, he managed to get a foot wedged in a crevice. The rest of the people with him, his tour group and another, were swept out of the canyon and into Lake Powell. Some of their bodies have never been found. How? How could water suddenly appear from nowhere and end almost a dozen lives in a few minutes? People who grew up in the high deserts of Arizona were well aware of the potential for disaster. We were warned about flash floods from the time we were little. We knew that those dry washes and canyons could end up filled with water without warning. We knew that the sun could be shining and the ground bone dry where we were, while a thunderstorm dumping water a hundred miles away could be sending a sudden flood our way. We knew. That knowledge didn't always save us. Floods are the second deadliest weather hazard, and flash floods are the deadliest type of flood worldwide. In the United States, deaths by flash flood are increasing, while deaths by other hazards are decreasing. And they can happen in places you don't expect. Desert denizens are well aware of the potential, but flash floods can happen in urban and suburban environments where more runoff is generated than the infrastructure can handle. They can happen in mountain valleys and streams, especially if rain falls on snow and causes unusually fast snow melt, or if rain falls on a recently-burned area, or where ice jams have backed up water. They can happen in areas that are perfectly flat, if a lot of water gets dumped with nowhere to go. They can happen downstream of dams that partially or completely fail. They can happen in any environment. And they're only going to get more frequent and more intense as global warming continues. With the recent flash floods happening in Arizona, Utah, and Yemen, it's time for us to discuss what to do. Flash floods are hard to prepare for and even harder to escape, considering they're defined by the fact they happen quickly. But there are steps you can take that will minimize your chances of being caught in one, and will help you survive if you are. Step One: Don't Get Caught! The best way to survive a flood is to avoid it in the first place. Know your risks: are you living in an area at risk of flash flooding? Is the place you're visiting prone to them? If you're not sure, check with local emergency management agencies. Folks at the local chapter of the Red Cross, for instance, will often be aware of flood risks for a given area. Have a plan. Find out ahead of time how you can protect your home and family members in case of flooding. Know the weather conditions. Keep apprised of the weather reports, and pay especial attention to flood watches (meaning to keep your eyes peeled for potential flooding) and flood warnings (meaning there's definitely flooding going on!). Don't camp or park in danger zones. Stay on high ground, especially if there's stormy weather in the watershed*. Scout out escape routes. Even if everything seems perfectly safe, make sure you know the quickest way to get up and out of danger if you hear a rumble. Make backup plans in case the weather turns foul. If you're going somewhere that might be dangerous if there are storms in the watershed, look for places nearby you can go that will be safe from flooding. That will keep you from being tempted to take a risk to justify the trip. Get away from the banks along recently-flooded streams. They could be unstable, and the water's probably still vigorous enough to damage or kill you. Don't play in the water! It's tempting, yeah, but just don't. Stay away from any and all flood water, storm drains, canals, culverts, and any other infrastructure meant to handle said flood water. Make triply sure kids understand the don'ts. You don't have to scare their pants off, but discuss the risks with them. Make them an active part of your research and planning. Step Two: Don't Go In the Water! So, despite your best efforts, you've been caught in a flash flood zone while the water's flowing. It's okay. Don't panic! You've got this. Turn Around, Don't Drown!® Avoid walking through flood waters. Just six inches of flowing water can sweep you off your feet. You really, really do not want to be knocked off your feet in a flash flood, folks. Those waters are powerful. Get to higher ground right away. Don't wait for it to get worse. Don't wait to see if it gets better. Find a safe route and go! Abandon your possessions. Don't pause to strike the tent or pack the bags. Stuff is just stuff. It can be replaced. You and your loved ones can't. Go. Now. Follow evacuation orders. If the authorities are telling you to GTFO, go where they tell you. Turn Around, Don't Drown!® Avoid driving through flood waters. Just a foot or two of water can float your car and sweep it downstream. And you can't tell by looking how deep the water is. The road bed could have been washed out. There could be debris covered by the water. Seriously, it's not worth it. Turn around and find a safer route. Don't drive around barriers. Ever. Those barriers are there for a reason. Head to high ground. If you can't get to your destination without going through a risky area, find somewhere safe and stay put until the danger's over. Better late than dead. Don't panic. Absolutely do. Not. Panic. You can still survive this. Grab a stick. If you're going to have to go through the water to get out, you'll want to be able to poke ahead for hazards like rocks, debris, and holes. Watch for snakes and other critters. Those poor buggers have been displaced, too, and they're upset. Attempt to avoid them. Look before you step. And feel it out with your stick. Find still water. Look for slackwater if you need to cross a flooded area. You're far more likely to survive if you can stay out of moving water. Find a nook and stay. If you can find a place to shelter above the waters, even if it's small, hunker down and wait it out. Try to grab and hold something sturdy. Point your feet downstream. Better to break an ankle than your skull. Go over obstacles, not under. If at all possible, avoid going under the water. Try to steer your way out of the water. Aim for a building or higher ground if you can. Head for anything you can grab and cling to that will get you out of the water or keep you from going further downstream. Remember Pancho wedging his foot in a crack? It's all that kept him from being swept into the lake and killed. Stay put. If you manage to get out of the floodwater and end up in a tree or on a bit of rock or similar, stay there and wait for rescue. Follow the directions of the rescue team. Seriously. You are probably exhausted and terrified, but try to stay calm and do what they tell you to. It's totally okay to fall apart later, but keep it together right now so that you and your rescuers can get out safely. If the water is still, get out of the car. Go immediately to higher ground. Most sources I've seen tell you to get out of the car no matter what. Ready.gov and Mass.gov both say to exit and go for high ground if you stall in still water, but stay in your vehicle if the water's moving, which is what I was taught in Arizona. Use your best judgement. If your car gets submerged, stay calm. If you can get out through the window, climb up on top and look for a safe place to go. If you can't get out, wait for the water to fill the car, then open your door and swim up to the surface. Once you're out of your car, follow the survival tips for surviving a flood on foot. I can't guarantee those tips will save you. The only guaranteed way to survive a flash flood is to not get trapped by one. Too many people underestimate the power of flood waters to kill. So be aware, take steps to prevent getting caught by flooding in the first place, and keep your wits about you if it does happen. *I can tell you from bitter experience that even though that flat, sandy wash bottom makes a bonza place to pitch a tent, it is horrible if there's a thunderstorm in the night. At worst, you're swept away and drowned. At best, you're awakened in the middle of the night by the stream that's now flowing through your sleeping bag, and you have to haul your soaked self and belongings to high ground. In the dark. In the rain. And you'll do a terrible job pitching the tent. Where you won't be able to sleep because you're too wet. And then you'll go fishing before dawn, because hey, you're awake anyway, and end up in a huge cloud of mosquitoes so vast they sound like a helicopter. And then bats will come to eat the mosquitoes and nearly brain you as they swoop in for breakfast. And you'll be trying to fend off the bats and mosquitoes with soaking-wet pillows. And you won't catch any fish. Best to avoid the whole thing and pitch the tent on high ground in the first place. Ashley, S. T., and W. S. Ashley (2008): Flood fatalities in the United States. Journal of Applied Meteorology and Climatology. Drobot, S., & Parker, D. J. (2007). Advances and challenges in flash flood warnings. Environmental Hazards, 7(3), 173-178. Haynes, K., et al. (2009). ‘Shelter-in-place’vs. evacuation in flash floods. Environmental Hazards, 8(4), 291-303. Jonkman, S. N. (2005). Global perspectives on loss of human life caused by floods. Natural hazards, 34(2), 151-175. Knocke, E. T., & Kolivras, K. N. (2007). 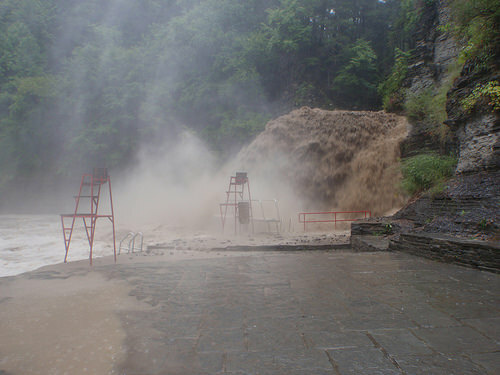 Flash flood awareness in southwest Virginia. Risk analysis, 27(1), 155-169. Zahran, Sammy, et al. (2008). Social vulnerability and the natural and built environment: a model of flood casualties in Texas. Disasters, 32(4), 537-560. Originally published at En Tequila Es Verdad.